When the 17 protesters insist on attending a restorative justice meeting as one group, rather than in two separate sessions, the prosecutor calls off the meeting. A restorative justice meeting that had been planned between Portland police and the 17 protesters arrested last summer during a Black Lives Matter protest was called off at the last second Wednesday. The collapse of the agreement between prosecutors and the protesters will likely mean a return of the criminal charges for the group, restarting the court process. The two sides could not agree on how the meeting should proceed – in two groups held separately, or as one – and who should be allowed to observe the process. The district attorney’s office attempted to enforce part of the agreement to divide the protesters into two sessions; the protesters wanted to remain together. “It became very clear that they were not coming to the table with the conditions that we had laid out ahead of time,” said Ackerman, who prosecuted the cases and held a noon news conference to address the sudden cancellation. Ackerman said she gave notice to the protesters’ attorneys ahead of time that she would be inviting the ACLU and the NAACP to observe. It was unclear why their presence became an issue; protesters have refused to grant interviews since the July 15 demonstration. Other parts of the dispute seem to stem from the lack of specificity in the agreed-upon terms filed in court. The two outside groups were never explicitly included in the agreement signed by the protesters, and the restorative justice process was to be completed “as directed by the district attorney’s office,” according to court documents. Cumberland County District Attorney Stephanie Anderson said that, in hindsight, her office should have spelled out all of the terms more clearly. Anderson, who did not speak at the news conference but answered questions from a reporter afterward, said she was disappointed. However, Anderson did not rule out the possibility that the two sides could return to the restorative justice process. Each of the protesters who was arrested was charged with one count of obstructing a public way. Some also were charged with other offenses, such as disorderly conduct and failure to disperse. The deal with the District Attorney’s office allowed the protesters to admit to violating a city disorderly conduct ordinance, a civil infraction that was discharged by the court in exchange for the chance at a future dismissal of all charges if the protesters fulfilled their end of the deal. Each protester would have been required to donate $140 to the victims compensation fund and pay $60 for the restorative justice meeting. The plan had been for the 17 protesters to meet with Portland Police Chief Michael Sauschuck in two separate groups over the course of the day. But the protesters said they wanted to remain together during the meeting, said Attorney Stacey Neumann, who represented protester Shadiyo Ali. Fred Van Liew, who was scheduled to facilitate the restorative justice meeting, agreed to the change, Neumann said, but Ackerman then canceled. 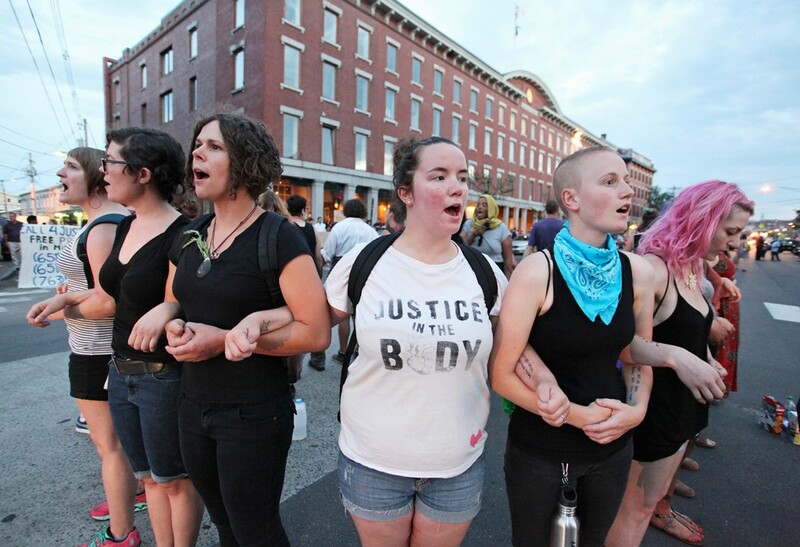 The 17 protesters were arrested when they blocked a section of Commercial Street on a busy Friday night in the Old Port. Portland police said the marchers failed to get a permit and discuss their plans with police, unlike a similar protest the week before. Sauschuck on Wednesday reiterated a position he has held all along – that the arrests and disputes could have been avoided had the group contacted his office first. Portland police said they tried to contact the organizers of the July 15 march before it began, but were rebuffed. The protesters gathered in Lincoln Park early in the evening and then marched, chanting, down Pearl Street to Commercial Street, with a police car in front of the group and two cruisers behind. There were a few shouts back and forth between protesters and some bystanders who objected to the “Black Lives Matter” chants, and a handful of drivers were delayed when protesters holding a banner blocked Custom House Wharf. The demonstrators removed the banner when asked to by police, who watched the protest for more than three hours before making arrests when the demonstrators refused to disperse. Other protesters continued the demonstration and those arrested were released a few hours after they were taken into custody.